Autographed! So, What Did You Dream Last Night? But Wait! During checkout use cuopon code "BOTH" and get an instant 20% discount. Shortcuts and Secrets to Remembering, Understanding and Controlling your dreams! One-on-One Dream Consultation With The Country's Leading Dream Expert. 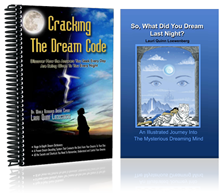 Choose from a private dream interpretation with Lauri via email or over the phone. Printed on thick stock, these beautiful certificates will surprise and delight.